What Dad does not love a mouth-watering, grilled steak? This Grilled New York Strip is full of flavor and sure to satisfy Dad on Father's Day. 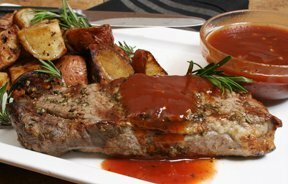 Treat him to this awesome steak recipe and he is sure to feel extra special this Father's Day. Check out our fish cooking guide for the best grilling method for flaky delicious grilled fish. Step-by-step instructions on how to grill a fantastic Beer Can Chicken for Dad on Father's Day.